You may choose to host an event at your community center or historical society, at a public day or festival in your town, before Independence Day fireworks, in your backyard, or even at a fair. 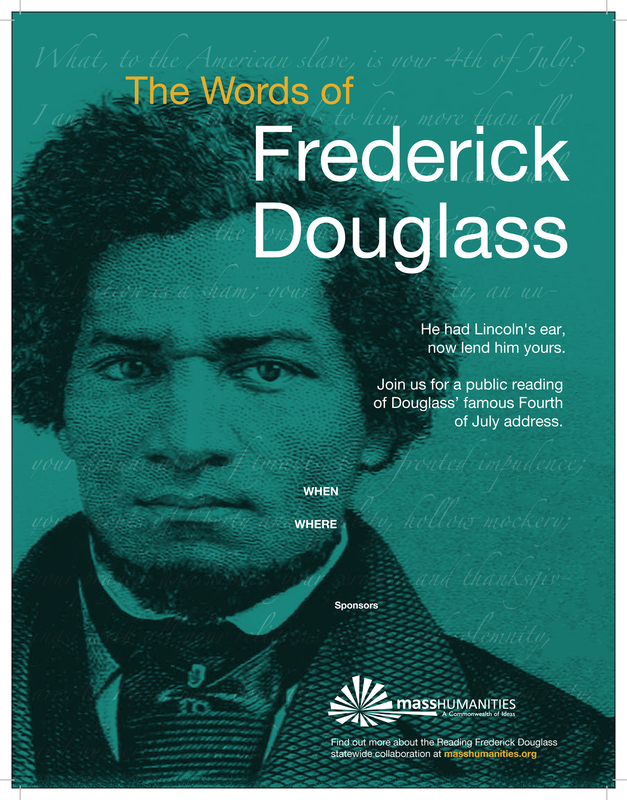 To organize a Reading Frederick Douglass Together event that includes a moderated discussion session and is sponsored by a nonprofit or government organization, apply for a Discussion Grant. For more information on grants and other ways to plan events, please contact Katherine Stevens at Mass Humanities: (413) 584-8440 x101 or kstevens@masshumanities.org. Step One: Choose a location. We suggest that you read the speech at a local event or commemoration. Any number of places would make for a good reading, such as with the lunch crowd in a public place, at the public library, during a 4th of July family barbecue, before the local fireworks display, or at microphones set up on the steps of town hall. You could also work with a private group and use the speech as your book club’s monthly read, for example. Step Two: Come prepared. The speech (edited for different lengths) is available below for download. Make copies for readers and audience members. If it is a large event, you may need to arrange for amplification, and depending on the location, you may need to get a permit from your town hall and/or arrange for wheelchair access and seating. If your event will include a moderated discussion, be sure to prepare for that. Local (community) colleges are great places to find discussion leaders, and Mass Humanities will fund a reasonable stipend for a humanities scholar to serve as a discussion leader. Step Three: Food and drink. People talk more freely and happily if they can have something to eat and drink. If the event is public, oftentimes a local market (including the supermarket) is willing to donate cookies or fruit and lemonade. Please read through Mass Humanities’ Publicity Guidelines, and you may also want to use our additional guide, Publicity: Getting the Word Out and the People In. Find out who they are and invite them! Find your Senator’s telephone and email. Find your Representative’s telephone and email. Phone and fax communications are most effective. Submit your event to your local NPR Online calendar submission form and other online community calendars. Some online calendars allow you to submit a small image for calendar listing. Here’s a Douglass image for your use. Don’t forget to submit your event to the Mass Humanities online events calendar. Below you will find downloadable posters for you to customize and use. You will need Acrobat Reader to edit the PDFs, and image processing software of your choice to edit the JPG. For the PDF version, utilizing Acrobat Reader, just fill in the details of your event on the screen, and then print and copy. PDF and JPG options below. Download this PDF with tips, discussion questions, websites, and articles.